Each of the fun activities in these handy little books brings out an incredible truth about a topic like God's grace, prayer, or faith. Hours of good, clean, educational fun in every book! About "Super Bible Crosswords (Young Readers Series)"
Discover Biblical truth and have fun at the same time! 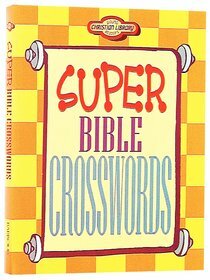 Every crossword in this collection is taken directly from the Bible-and with all of the fun illustrations, Super Bible Crosswords is a perfect combination of education and entertainment.